Have you been doing radar plotting? I know that the navigators get fed up with this irritating question during third-party inspections. And when the navigator is just about to answer that question with a Yes, it’s frustrating for them to find that there are no radar plotting sheets onboard. If this has happened to you too, then do not worry. It is not very uncommon sight these days. The reason some of us do not practice radar plotting is one or both of these. 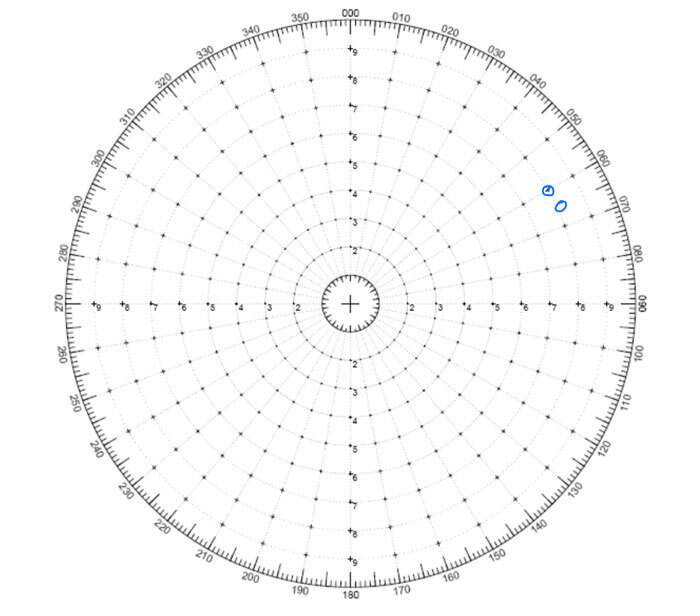 In this post, I will definitely be discussing how to do radar plotting. But before we start on that, we need to agree on the point if all this is really required and is the radar plotting helpful to the navigators in any way. In one word the answer is “Yes”. Well, radar plotting is an alternative for ARPA and thus it will be handy when ARPA is not working. Let us assume a very realistic situation. ARPA of one (or both) of your radars stopped working in the mid sea. Of course, the vessel is not complying with the SOLAS. Master will report the fact to the company and company will seek dispensation from the flag to sail and arrive at next port without working ARPA function of the radar. It is understandable that flag will not deny the dispensation if the ARPA can only be repaired by shore support or by providing a spare part. The flag will give the dispensation on a condition that the navigators will use radar plotting for all the targets on the radar. Now believe me when I say this. If you haven’t been practicing radar plotting, you may find it difficult to navigate the ship safely in this situation. This is not the only situation where navigators need to rely on radar plotting. Even when your ARPA is working, you may notice that the radar is not holding on to the some of the targets. By this I mean, the acquired vector is moving away from the target. A quick radar plotting for that target can give the clear picture of the movement of the target. The only issue is that like the celestial sight, to be effective radar plotting too need practice. 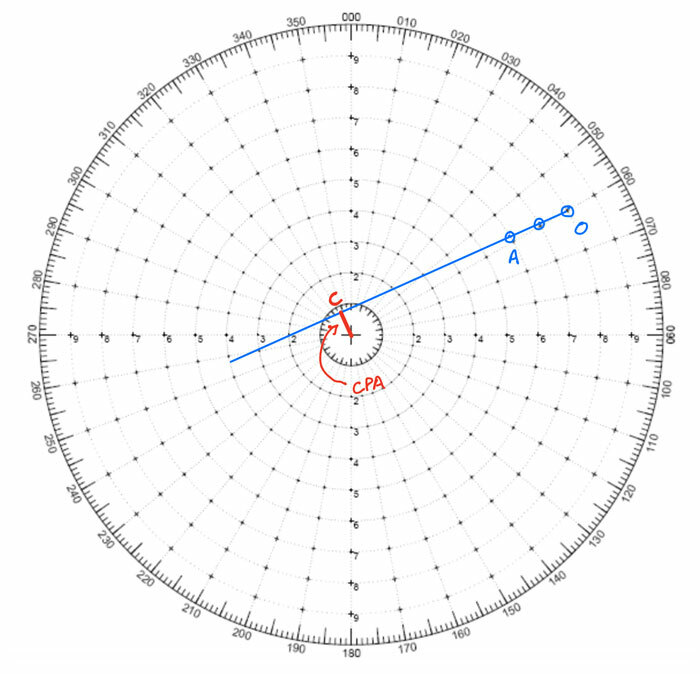 Now that we understand the significance of radar plotting, let us understand how to do it. We already discussed that radar plotting is an alternative to the ARPA. Let us see how to get this information by radar plotting. 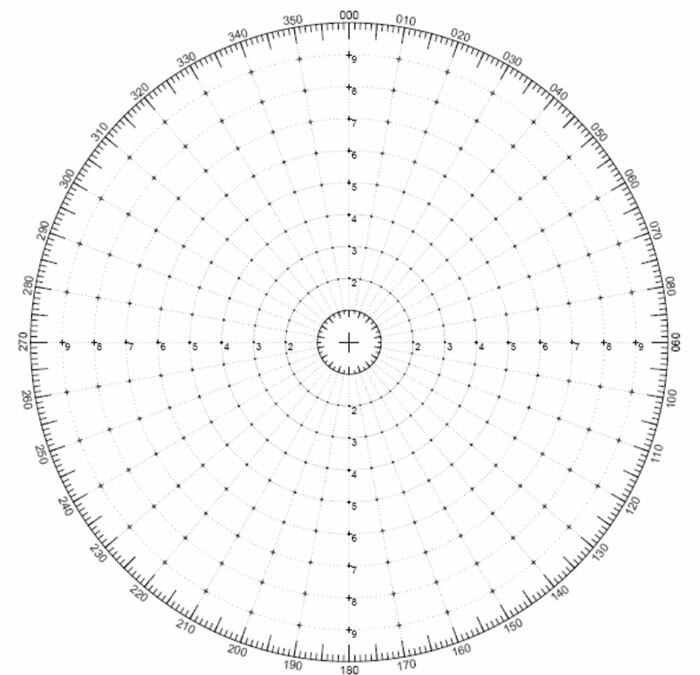 This is how a radar plotting sheet looks like. When we see the target on the radar, we take the bearing and range of the target and note down the time of observation. We then plot this on the radar plotting sheet. let us say we noted following bearing/range of a target at 1800Hrs LT.
Let us plot this on the radar plotting sheet. This point of first observation is named point “O”. 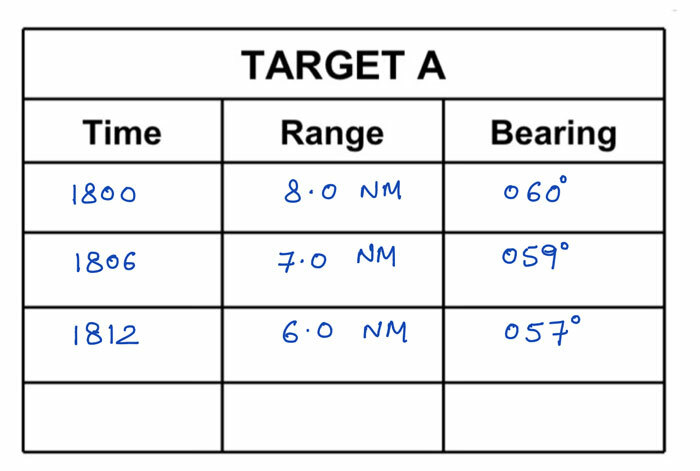 Now after some interval, take the 2nd and 3rd set of observations of the target and plot it on the radar plotting sheet. Here are our 2nd and 3rd observations. Plot these on the radar plotting sheet and extend the line joining all three points. Name the point of last observation as point “A”. This is the line of relative approach of the target towards our vessel which we have assumed at the center of the sheet. 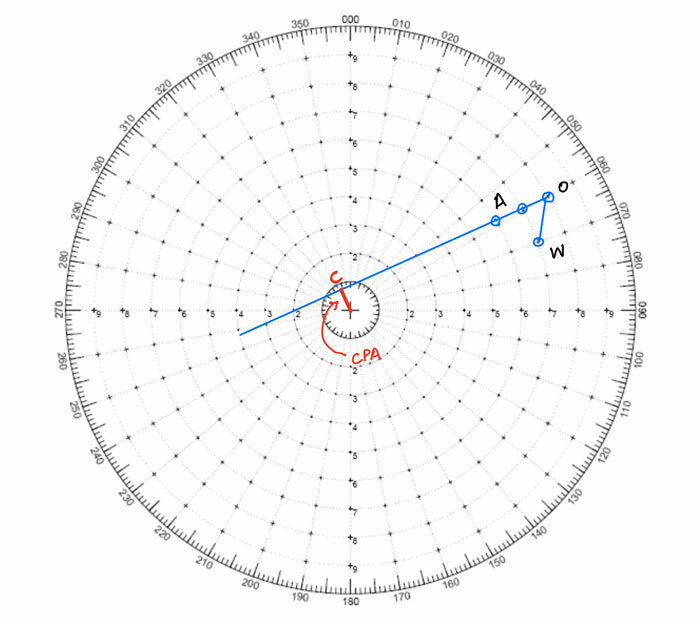 Now for CPA, we need to find the closest point of the line of approach to the center. 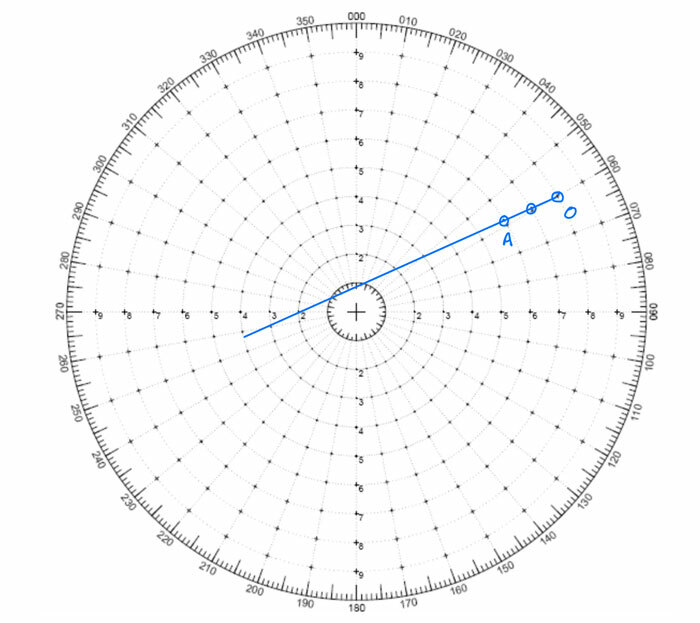 To do that just draw a line perpendicular to the line of approach and measure the distance of this line from the scale in the radar plotting sheet. The CPA here is around 0.8NM. 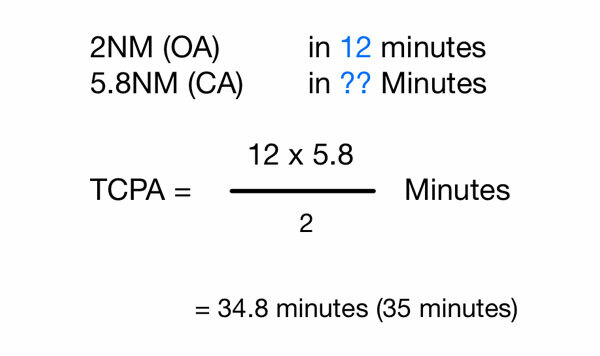 To calculate TCPA, we just need to calculate the time required to reach at point “C” considering it took 12 minutes to cover distance OA. To do that measure the distance CA and that would be 5.8NM in this case. Now with simple mathematics calculate the time the target would take to cover 5.8NM with the relative approach speed. This would be the TCPA. In this case, the TCPA would be 35 Minutes (at 1847 hrs LT). Next is to find the course & speed of the target. To find that, from point “O” draw your course in opposite direction and cut the distance your ship has traveled for the time period of “OA” (12 minutes in this case). Let us say your course is 045 degrees and speed is 12 knots. In 12 minutes your ship with speed 12 knots will travel 2.4 NM. SO from point “O” draw a line in direction 225 degrees and measuring 2.4 NM. Name this point as “W”, such that WO is your course. Now join W & A. WA is the course and speed of the target vessel. Measure the distance WA. This is the distance covered by the target in 12 minutes. With simple mathematics, calculate the distance it would travel in 60 minutes to get the speed. In this case, the course of the target is 300 degrees and speed is 7 Knots (WA measures 1.4 NM). There is one more thing that we can get from radar plotting. There are two areas that we need to explore in this. 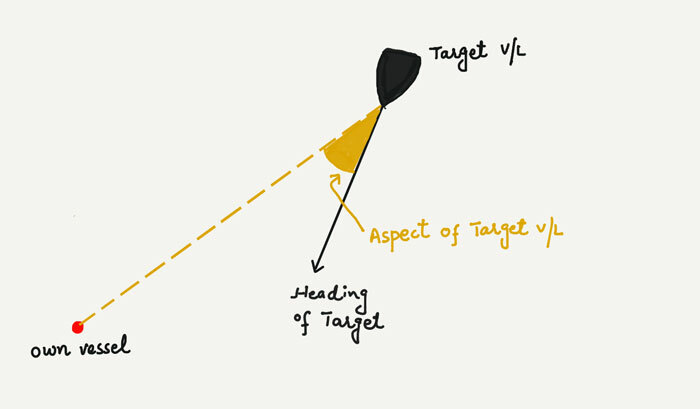 One what is the aspect and how to calculate the Aspect of the target. And second what is the significance of the aspect. First the definition of aspect. The aspect of a vessel is the relative bearing of own vessel from the target vessel. 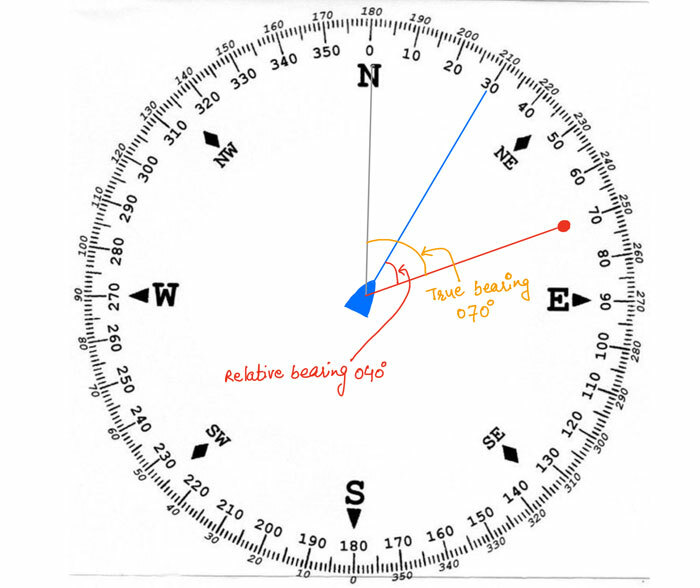 For the starters, this is what the difference between the true bearing and relative bearing. 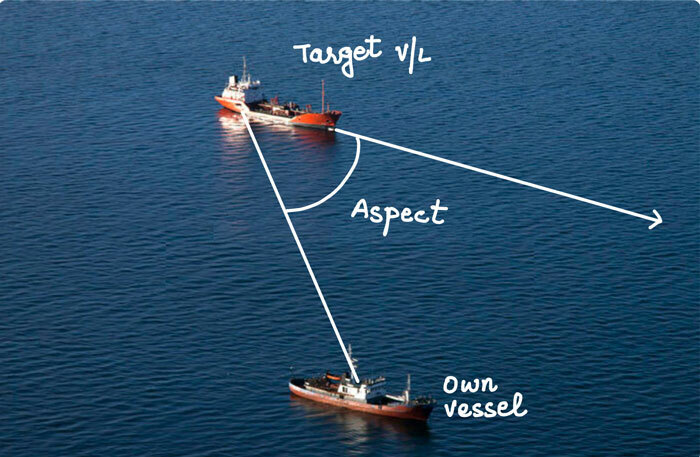 Here is the simplified picture of what aspect of the target vessel is. And here is how it would look like with real situations. Now let us come back to the radar plotting sheet and the situation we have discussed so far and let us get the aspect of the target vessel. 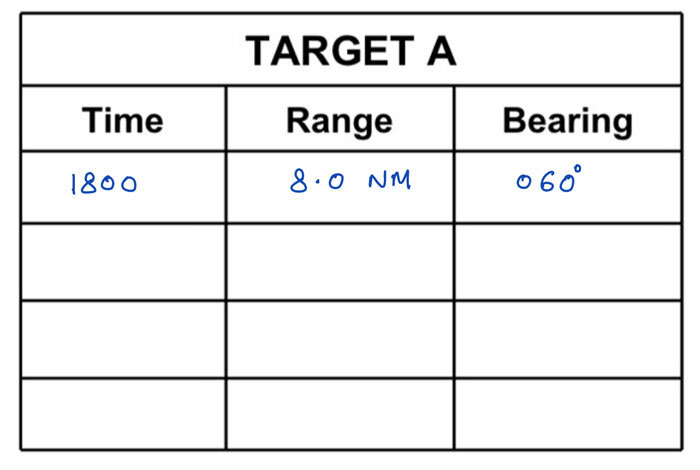 Join own ship’s position (which is at the center of the plotting sheet) to the target vessel’s last position (which is at point “A”). Extend the course line of the target vessel (Line WA). 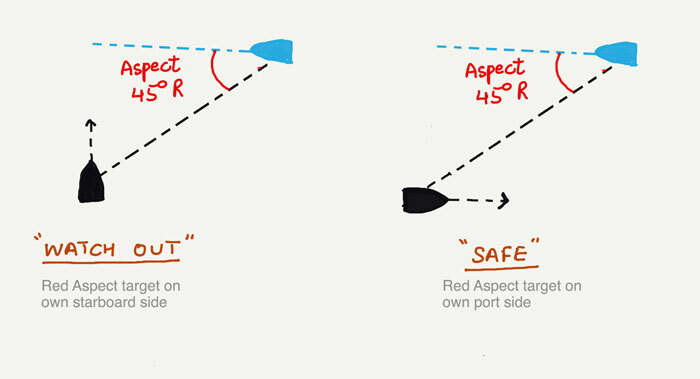 The angle between these two lines is the aspect of the target vessel. The aspect of the vessel is written as 0 degrees to 180 degrees Red or green. If we will be able to see the red light of the target vessel, then the aspect will be “Red” and the value will be anything from 0 degrees to 180 degrees. Same applies if we will be able to see the green light of the target vessel. Just to put this in perspective, here is what will be the aspect of the target vessel with different headings. If you had noticed, I have denoted the own ship with just a dot and have not shown the heading of own ship. This is because when calculating the aspect of the target vessel, own ship’s heading is irrelevant. Most navigators would get confused if we show own vessel’s heading too. In radar plotting, we use the relative approach of the targets. It is the easiest way to find the CPA of the targets. But the issue with the relative approach is that we do not know with certainty the angle at which the target vessel is approaching us. The course of the target can give us this information but we need to compare this with our own course or heading to get a sense of angle of approach of the targets. With the aspect of the vessel, it becomes easy and quick to understand the direction of approach of the target. For example, compare these two statements. A target is 2 points on our starboard side with course 265 degrees and our course is 330 degrees. A target is 2 points on our starboard side with the aspect of around 60 degrees red. 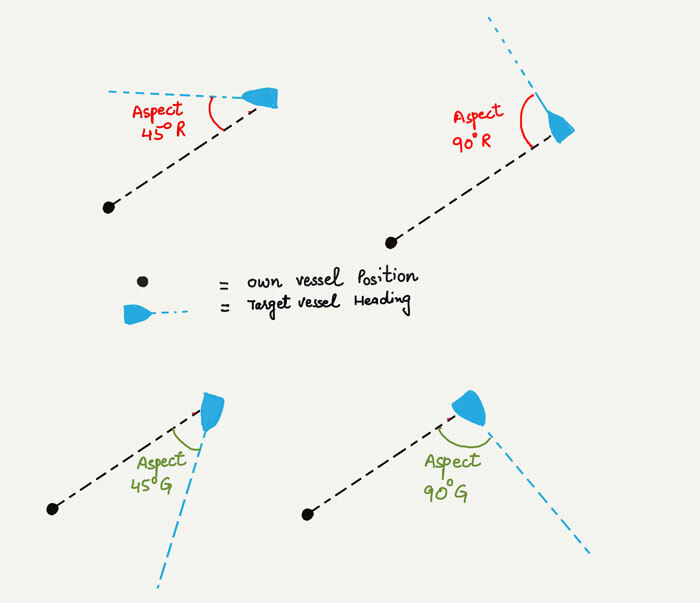 Which statement would give a clearer picture of the angle of approach of the target? When answering this question do not forget to consider that you just have these numbers. You do not have this information plotted on the radar screen as ARPA is unavailable. If you think a bit, you will notice that it is much easier with the second statement. Let me clarify it with a realistic example. Where is this ship headed? Two duty officers present do the radar plotting and reply with different answers. The first duty officer replies, “her course is 265 degrees”. The second duty officer replies “her aspect is 60 degrees red”. Which information do you think I will use? Again, remember we have inoperational ARPA. I would use the second information because with this I clearly and quickly know where that ship is heading. 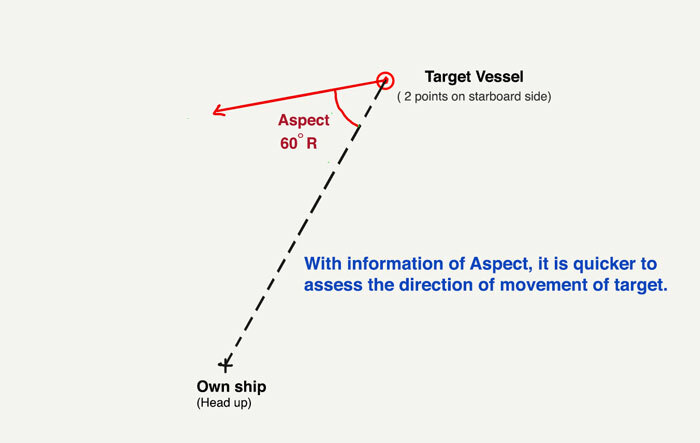 In simple words, the aspect of a target describes how much of the target vessel’s profile we will be able to see. If the aspect is “90 degreed Red”, this means that we will be able to see the complete port side profile of the target vessel. If the aspect is 0 degrees, this means that we will be able to see the front profile of the target vessel. Now that we know exactly what the aspect of the target is, we can use this in a number of other ways. If we are sailing in moderate or heavy traffic area without ARPA, it becomes extremely important that we identify (& segregate) the targets that are passing clear and the one that is not clear. Applying the below principle is one of the ways. All targets with Red aspect on our port side and with green aspect on our starboard side are usually “no danger targets”. All targets with red aspect on our starboard side and with green aspect on out port side are the targets we need to watch out for. Here is the example of the first point. This does not in any way mean that we should not monitor the targets with red aspects targets on our port side (and green aspects on our starboard side). The above statements help to a certain extent to prioritize the targets. If we understand the concept of the aspect of the target, we can devise our own ways to use this information during navigation. 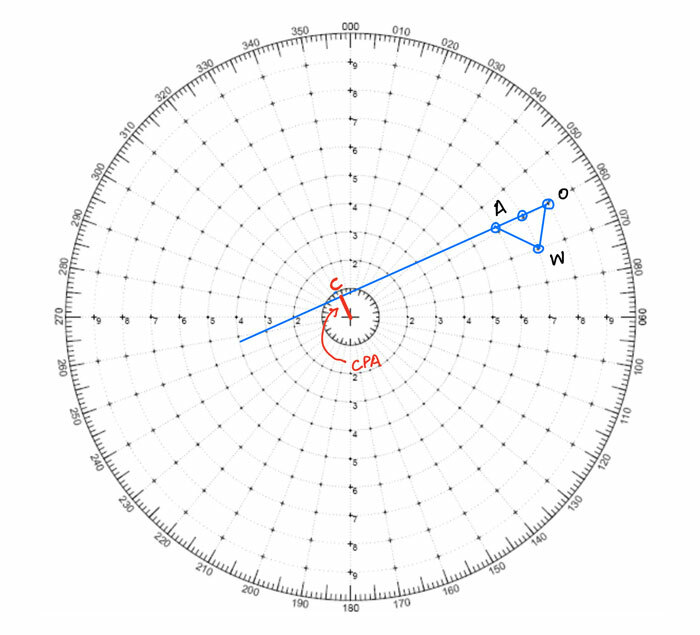 We now know the basics of radar plotting and it is time to move on to little-advanced ways of using radar plotting. Let us say we did the radar plotting of a target to find that the CPA is 0.8NM but we want to maintain 2NM CPA with this target. The best way to increase the CPA is to alter our course. But how much course we must alter to maintain that CPA? Radars have the functionality called “Trial maneuver” where you can set the new course to see the new CPA/TCPA with all the acquired targets. This is a wonderful tool to know the course/speed to change to maintain a certain CPA with a target. But this functionality is only required for radars fitted on vessels more than 10000 GRT. But if our ARPA is not working or if we are on a ship less than 10000 GRT, radar plotting can do this job too. Let us take the same example we used earlier. Target’s CPA is 0.8 NM and we want to maintain CPA of 2.0 NM by changing our course. Draw the new line of approach from point A such that this line passes through 2NM radius (CPA 2NM). Now as we are not changing our speed, the length WO will remain same. 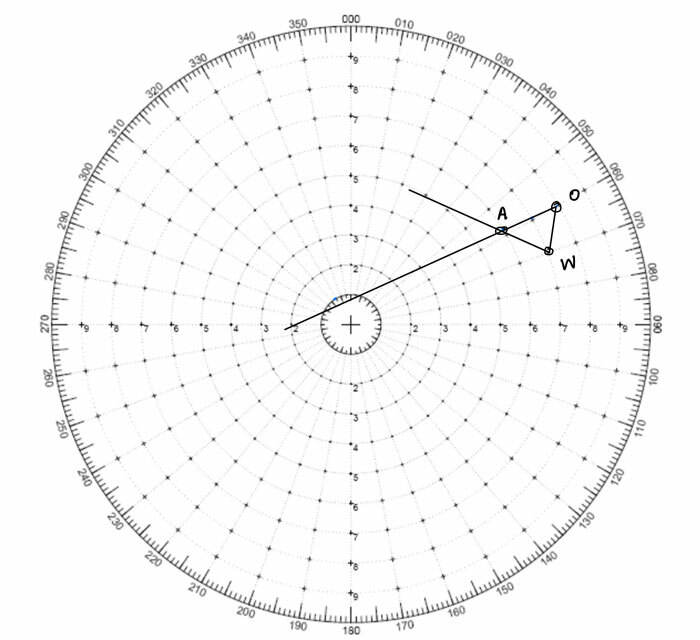 So measure WO and from point W, mark a point O’ on new approach line such that length WO is equal to WO’. Join points W and O’. WO’ is the new course that we must make to maintain CPA of 2NM with this target. How much speed must we reduce to maintain a certain CPA with the target? How much speed must we reduce to maintain a certain CPA with the target if we also altered our course by 10 degrees to starboard? How much course and/or speed the target must make to maintain a certain CPA with our vessel? How much course must each vessel alter to maintain a certain CPA with each other? I will briefly cover few other situations. From point “A”, draw your opposite course. The point where it cuts the dotted line, name this point as W’. From W’, draw the course of the target. Where it meets the desired line of approach, name this point as A’. 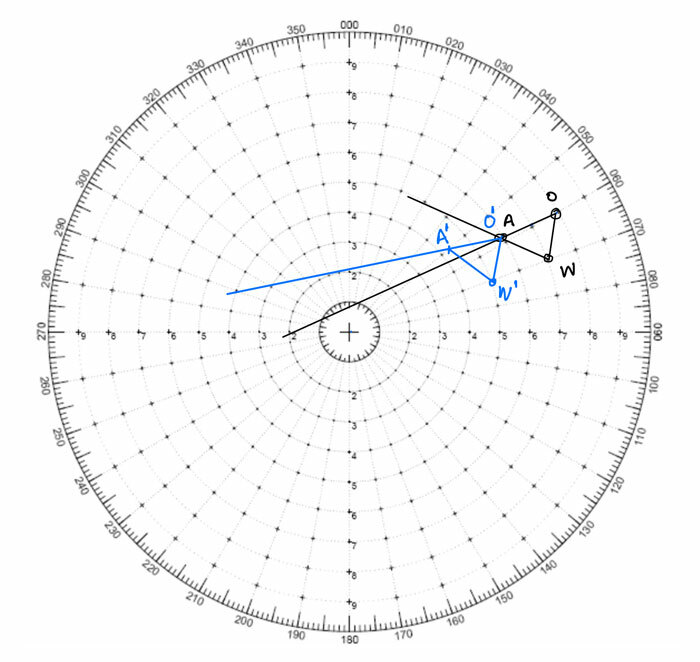 As own course and speed remains same, from point A (also named O’ in the new triangle) draw your own course in opposite direction such that O’W’ is equal to OW. 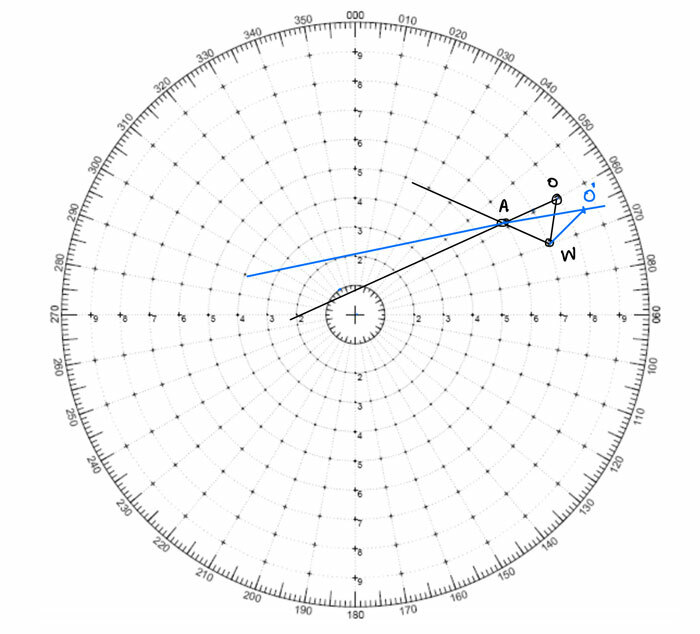 From point W’, cut a point on new approach line such that W’A’ is equal to WA as the speed of the target is not changing. 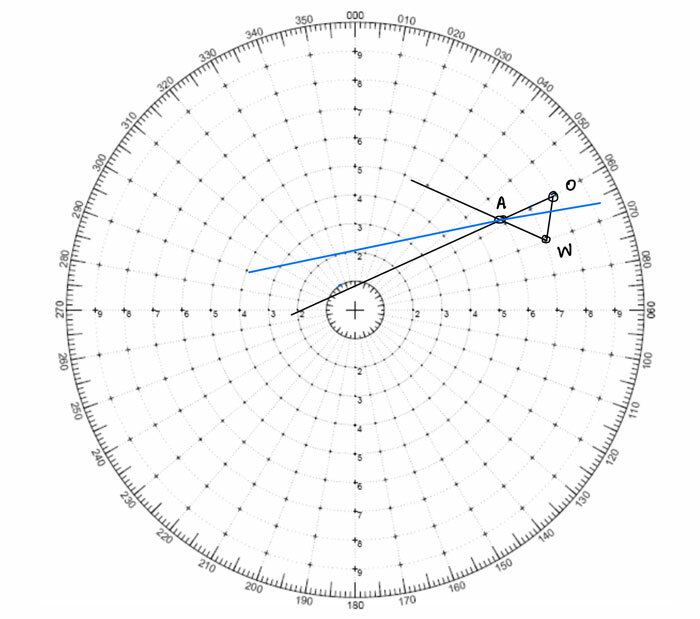 Measure the angle of W’A’. This is the new course that target must alter to maintain CPA of 2NM. 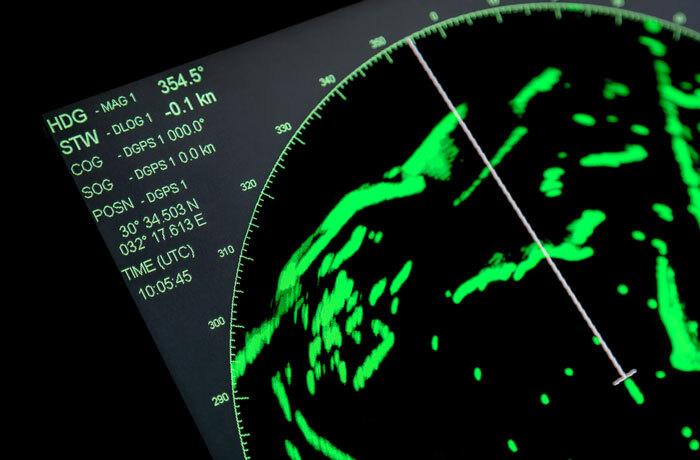 With ARPA on board ships, the art of radar plotting is fading away. But it is not that radar plotting is not relevant nowadays. In situations like sailing with in-operational ARPA under flag dispensation, radar plotting will be of great help. But if we haven’t been practicing radar plotting, it can’t effectively substitute ARPA in situations when it is desperately required to. Very interesting sir ..It would be a great help if you can make a blog covering the various Collison prevention situations and their relevant action .Thanks a lot sir.. awaiting your positive feedback!! Thanks, Ankit. I will surely write on that. Dear Sir, Can I obtain CPA of a target while i only known range of target and vector is 30 minutes? If possible, please kindly answer. It is two or more bearings of the target that is required to get the CPA. Another very well written article from you Capt. Rajeev. Shall be of great assistance to navigating officers.Keep up the good work. Well written post sir, whole funda of radar is cleared, thnx alott for a wonderful post. Thank you Sir, very clear and interesting post, a lot of useful information. Thank You So Much Sir, Best And Easy Way Ever I Had Been See. Thanks for the article, it has been very helpful. A question that has come up in my sample exams is: Question: after a bold alteration to starboard my new CPA is well over 3 Nm, how long do I need to hold this new course before I can return to my original course to maintain a CPA of 2 Nm. I really hope you can help me answer this question? Thank you very much for this. 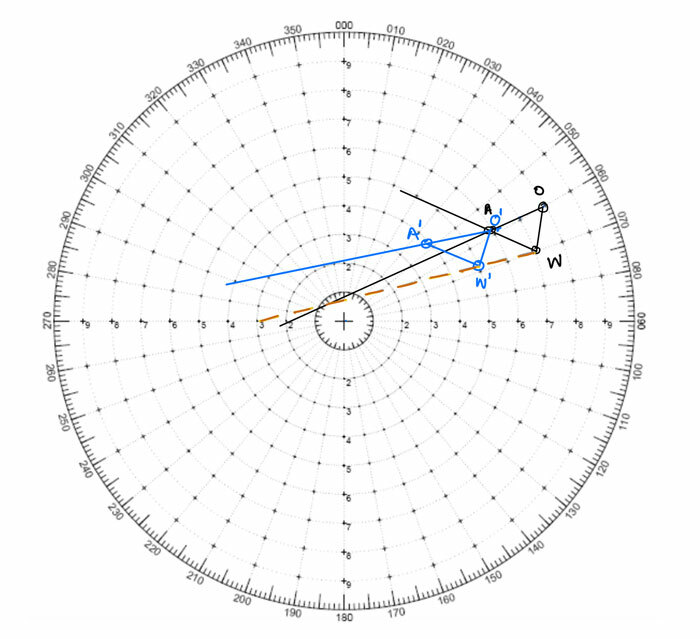 I lost my radar plotting notes from college and wanted to revise it. This was perfect. I have an exam in another 2days and i want to ask 3-4 questions to u regarding the ARPA. I have the pics of the questions too! It would be very appreciable if u can send me ur contact number sir! Sir i always find your articles intersting. I want to correct you that here you denoted aspect 60 degree approx. but the correct aspect here is approx. 90 and exact value is 92.5 R. you have taken relative brng of target from our vessel but its relative brng of own vessel from target vessel. Thankyou sir for ur articles keep writing we find these very intersting.